Engaging with the question of the extent to which the so-called human, economic or social sciences are actually sciences, this book moves away from the search for a criterion or definition that will allow us to sharply distinguish the scientific from the non-scientific. Instead, the book favours the pursuit of clarity with regard to the various enterprises undertaken by human beings, with a view to dissolving the felt need for such a demarcation. In other words, Read pursues a 'therapeutic' approach to the issue of the status and nature of these subjects. 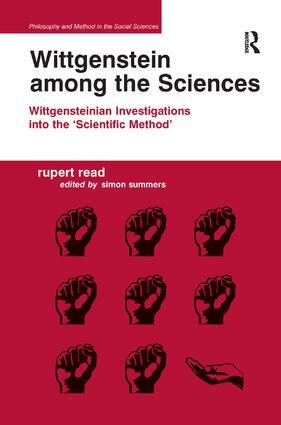 Discussing the work of Kuhn, Winch and Wittgenstein in relation to fundamental question of methodology, 'Wittgenstein among the Sciences' undertakes an examination of the nature of (natural) science itself, in the light of which a series of successive cases of putatively scientific disciplines are analysed. A novel and significant contribution to social science methodology and the philosophy of science and 'the human sciences', this book will be of interest to social scientists and philosophers, as well as to psychiatrists, economists and cognitive scientists. Contents: Preface; Introduction, Simon Summers; Lecture Transcripts: Theories and non-theories of the human sciences; Part 1 Wittgenstein, Kuhn and Natural Science: Is Kuhn: the Wittgenstein of the sciences? ; Kuhn and incommensurability: an interpretation; Wittgenstein and Kuhn on incommensurability - the view from inside; Values: another kind of incommensurability? : on incommensurability of values in science; Does Kuhn have a 'model' of science? ; Inter-section: an outline Wittgensteinian elicitation of criteria. Part 2 Wittgenstein, Winch and 'Human Science': The ghost of Winch's ghost; The hard case of (severe cases of) schizophrenia; Extreme aversive emotion; Wittgenstein contra Friedman; 'Dissolving' the hard problem of consciousness back into ordinary life. A concluding summary; Rupert Read: interviewed by Simon Summers; Bibliography; Index. Rupert Read is Reader in Philosophy at the University of East Anglia, UK. He is author of 'Applying Wittgenstein', co-author of 'There is No Such Thing as a Social Science' and 'Kuhn' and editor of 'The New Wittgenstein' and 'The New Hume Debate' Simon Summers is Associate Tutor at the University of East Anglia, UK.